As Black Belt, got to admit, that sometimes one tend to think that everything is statistics. That a statistical tool can reveal a relationship between a critical x and the output. That inertia of starting analyzing if a set of data is normal or not, if the cp or cpk is higher than 1.66 or if the gage R&R used to obtained that data is reliable. Yes, of course, Green or Black Belts have a tendency of jumping right away and perform statistical analysis. This is exactly when this great book make sense. Understanding Variation, The key to managing chaos, isn`t a book about how to use tools to perform fancy analysis. Is about using the right tools to take decisions and to understand what`s going on on our processes. The book is more an eye opener about how to use the basic control charts to understand the variation that affects a process. It is essential to understand that there are extraordinary events that happen and affect the performance of a process. It is important to note this, in order to decide whether or not to take action to maintain control over a process. This is a key rule to understand and remind when analysing data. The fact that a single point is out of control doesn't mean the process is completely out of control. When a point exhibits an unusual behaviour, we need to ask ourselves if there was an external agent that cause the process to behave this way. In this case, we need to examine this point alone, and not the whole process. The process may be well in control, but this point may reflect external causes affecting the process. In this case tools to examine special cause variation may help; 8Ds. So, if one single point doesn´t always mean that we need to take action or doesn´t always mean that the process is performing bad, maybe a couple of points would do the trick right? Well, that`s another thing this book explains better. Sometimes, specially when we analyze results, most organizations tend to compare one single month vs the same month from last year, or if we want to analyze further we may add the previous month from this year in the equation. As it is displayed in the book, this isn´t enough either. Many companies today focus on the current month, if we´re lucky, in the current year. Sometimes 6 or 12 data points doesn´t offer the whole information. In other to correctly identify if a process has changed; improved or worsened. The book shows some examples on how, looking just a portion of data, might not provide enough information to take the right decisions; interpreting this data would lie to us. In some cases we need to go back 2 or even three years to clearly see why sometimes the process does achieve the targets and why some other cases do not. This is another key rule. If a process hasn´t been changed for better or worse it is impossible that alone would be able to always meet targets. In this sense, the book will give an specific observation: arbitrary targets are exactly that, arbitrary. And sometimes do not have something to do with the process itself. A great insight in this subject is given in the book. When a process looks stable, without points behaving in weird ways, it is necessary to analyze the process as a whole. In this case, this is common cause variation. Under this scenario six sigma tools are useful. Either to reduce variation or to make a shift in the process. This is key, because, how many times a manager has requested explanations on a single point? how many times a manager has ignored the sings from a process requesting help? Understanding this two types of variation will help to any person who examines a process to distinguish when action is needed and when isn´t. This book is a great reminder of the basic statistical rules used in SPC to observe a process and how to correctly look at data to take the best decisions the process can tell. The book includes some study cases so the reader is able to understand and see clearly how the traditional method to analyze data reveals a reality completely different when using the right tool and applying the principles of variation. 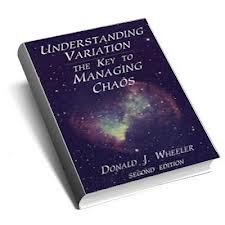 So, no matter if you are related to SPC or 6 sigma methodologies, or if you just want to understand what`s going on on your process, this book will help you to understand what the process is telling you. In consequence will reveal the voice of the process and will help you to take the most appropriate decision. Really a great, simple and powerful book for any manager to read. Thank´s for reading. I`d love to read your thoughts. Please, don't be shy and leave a comment.